Spammers don't have to be of the hacking type. Many are just known as forum spammers. They have a product to sell and using any open forum to do so is an easy way to get a link back to their website. Forum spamming is a constant battle for website operators. If you don't want the spammy product endorsement type I suggest using a service that blocks based on either a database list of known and reported email addresses. That eliminates the need to block by IP address. Blocking by IP address sometimes limits legitimate traffic because those IP addresses could be dynamically assigned and the very next person who happens to get that address may not have any ill intentions at all. Blocking people by IP address potentially limits your website traffic. Although blocking by IP is not a really favorable approach it is sometimes necessary. ISPs who operate really cheap virtual web hosting or free email services who offer free and untraceable email addresses fit into those types of spam sources that IP blocking is a necessity. Those ISP network operators who allow spam to flow from their networks have modeled their whole business on pandering to the spammer. Operators who claim to have anti-spam policies rarely enforce them as it is in their best interest to allow the spammy service to continue. When their network IPs become blacklisted by RBL services they just purchase new blocks of IPs and pass the old blacklisted ones off to unsuspecting customers at a below market hosting price. I suggest using a service like CleanTalk. 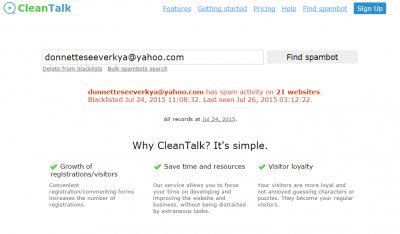 The folks over at CleanTalk offer fresh lists of spam email addresses, IP addresses and they also offer the ability to block by network CIDR which allows even more possibilities. 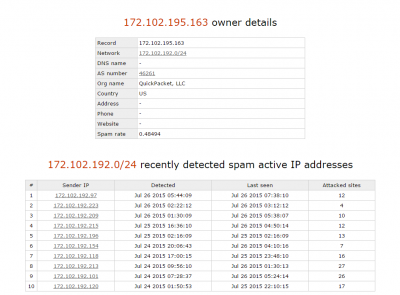 Each know network is listed by their AS number and there is a corresponding spam rate published for that operator giving you the ability to totally block a whole range of IP addresses from a particular bad actor. We typically block any network who consistently runs a 65% spam rate especially if it doesn't appear they are doing anything to curb the spamming on their network. Last update on July 25, 10:18 pm by Admin.